With the vast selection on Amazon, the days of filtering your search by category are long gone. A high percentage of Amazon customers now shop using the search box. They type in keywords that describe the products they are interested in and browse through the options that appear in the first few pages of the search results. Some customers might be more specific in their searches; they have a clear idea of what they want. Others keep it very broad; they are looking for ideas before narrowing down their searches. For brands to get sales, their products need to appear in the search results for keywords relevant to their products. A brand wants to have a mix of these terms. The major keywords will have a lot of competition yet generate the most traffic. The more specific keywords will generate less traffic but typically have higher click-through rates, as the traffic is more focused. The niche terms will drive only a small amount of traffic but will have very little competition, making it easier to rank high for those terms and get top exposure. The goal is for a brand’s product to rank high in search results, appearing on the first page for as many keywords as possible for maximum exposure. Typically, the larger brands in the industry will focus their attention on ranking high for major keywords, while the smaller brands that have a smaller market share will have more success focusing their attention on more specific keywords, where the competition is less aggressive. You can also do this directly on Amazon by typing a few words in the search box and viewing the autocomplete suggestions. There are also tools that allow you to identify completely new keywords to target. 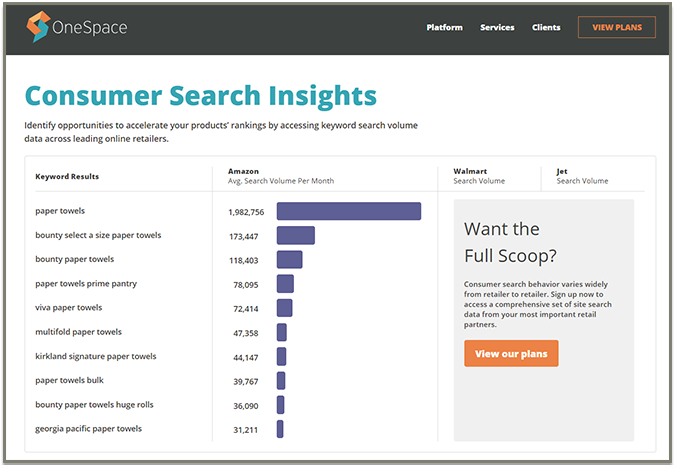 OneSpace’s keyword research tool, for example, lets you to view the most popular search terms by product category, making it easy to uncover new keyword opportunities. Let’s say you’re doing keyword research for baking cups. With most tools, you would only be able to discover popular search terms that contain that exact keyword. With OneSpace’s category-level insights, however, you quickly discover that “cupcake liners” actually has a much higher search volume than “baking cups.” By targeting both keywords, you can more than double the traffic to your product page. Some tools also allow you to type in a competitor’s ASIN and see what keywords they are ranking for. Other great sources to obtain keyword data are Amazon Marketing Services (AMS), Amazon Retail Analytics Premium (ARAP) and Google AdWords. There are some great reports available in AMS that will share the keywords customers are typing into the search box. Setting up broad-match and automatic sponsored product campaigns is the best ways to identify new terms. If you are an Amazon vendor, make sure you have access to ARAP. While it comes at a cost, there are some useful reports that share customer search terms, as well as customer behavior that brands can leverage when identifying keywords. Also, if the brand is running Google AdWords, it can pull out any keywords working on Google and use them on Amazon. While Google works differently than Amazon, there are still some keywords that will apply to both. One thing brands must be clear on is that Amazon’s number-one priority is relevancy. The products must be relevant to the keywords for them to rank in the search results. To be considered relevant, the item needs to have good click-through and conversion rates for those keywords. Amazon wants to put products in front of the customer that they want and will buy. Not only does a product need to be relevant, but for an item to rank high for a specific keyword, it also needs to be doing high-volume sales ahead of the competition. The sales rank is driven by sales volume. Once a brand has a clear list of keywords to target, it then wants to include these terms in the product content that is indexed by Amazon’s search engine. This content includes the title, bullet points, product description, and back-end keywords. When including keywords, brands need to make sure that they are not keyword-stuffing and that the content is compelling to the customer. If the content is not compelling, customers won’t click and buy, negatively impacting click-through and conversion rates. If it doesn’t make sense to include the keywords in the front-end (for example, title and bullet points), include them in the back-end search terms instead. Striking the right balance between keyword-rich and compelling content is key. While keywords are important on Amazon, there are other factors that influence a product’s exposure, in addition to the ones mentioned previously. These include availability, delivery message (e.g. Prime), pricing, and customer reviews and ratings. A product needs the full package to maximize its sales potential on Amazon.